Mary was born on March 18, 1911 and passed away on Wednesday, November 1, 2017. 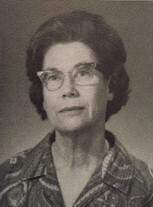 Mary was a resident of Texas at the time of passing. She graduated from high school there and the family returned to Fort Worth the next year. She was thankful to welcome her husband home safely from his time in the Army. They enjoyed grandchildren, church activities, playing bridge, baking treats for friends and volunteering at Masonic Home and School. You were a great teacher & person. My thoughts and prayers are with your family. May you rest in peace.